So I guess the subject doesnt give much away, but hear me out. I guess the camera is OEM, and I have no idea who the manufacturer is. When the camera powers up the camera doesnt pan around as part of the power up sequence. There is a green LED on the front centre of the IR leds, that is also off. I cant talk to it over ethernet - but the ethernet lights do flash. The camera used to work, but one day it stopped. I've soldered wires to J2 (rs232) and can terminal in. Copyright Winbond Limited 2001-2006. All Rights Reserved. Checking the image gives 0 checksum errors. ERROR: Data Abort @ pc=0x7F003100. Looking at the pyhsical PCB shows some (maybe) damage to pins 80-90 but my decent soldering iron is at work. Definitely flash corrupt issue - thats what it says..
Can try reflashing something see if it can take, otherwise may be a write-off unless you feel up to resoldering smd mount flash and putting a new chip on.. I think I'm going to try resoldering these - or putting jumpers on. I dont fancy replacing a flash chip - but I've had to hand solder the ARM pitch at work - so thats not too daunting. Presumably if those pins have been damaged then a new flash image wouldnt take anyway. hmmm, such hardware damage doesn't usually occur overnight ? I am as flumuxxed as you to be honest, and I have no idea how that came to be. I should have a decent bit of luck soldering most of those back - i think one is a power rail and bends back underneither the device, so that may require a jumper. So, I've resoldered those pins and I'm getting something different now. I am taking this to mean that part of it is working as the serial isnt set, and I get ERROR:Prefetch Abort @ pc=0x7f007DE0. All of the pins looked soldered, but could it be the case that one actually isnt, and so always returns 0 (or shorted to power so 1). ERROR: Image 7 checksum error found ! Image check finished. 1 checksum error found. Could this still be an incorrectly soldered pin, or is it more likely a dodgy flash? Is it possible to download the image and verify it and/or find another compatable image? Either one of the higher address lines is borked on the board -> the flash chip (which is possible looking at your photo), or the flash needs reflashing. You are getting there though. Suggest download a data sheet for the flash chip and check which lines are for the upper memory area access so you can buzz them out. That is exactly what I am thinking. [00FFFFD0] 55555555 0000000A - 00006020 00004D28 UUUU.....`..(M..
[00FFFFE0] 00FFFF89 7F008CDF - 00000001 0000451C ............E..
 00000000 FFFFFFFF - 00000000 0000791D .............y..
 00000000 E28DD0FC - 00000000 00005EF0 .............^..
 00000000 00006325 - 00000000 0000451C ....%c.......E..
Actually having actually seen the full photo now (jumped on a vpn) - thats the CPU, not the flash chip. Still, looks like address line problem. I'd just return the unit - its definitely a QC issue. Contact the supplier, and arrange for another one. I'm not sure where RAM is located in these devices. Try finding out and do a fill and dump on page boundaries. admin, the thing has been taken apart and it's already out of its warrenty - so I guess a return would be out of the question. schufti, what do you mean by fill and dump of page boundaries. Sorry but this is the lowest level I've worked with before (at least on a consumer item). thank you both for your help though, it is extremely useful. *UPDATE* I've tried buzzing out the address connections and everything seems to be there - though it is still early here so I'll give my brain a chance to settle down and try again later. Out of interest, reading http://wiki.openipcam.com/index.php/Test_Firmware_Installation seems to suggest I can load another firmware to a different part of the flash and get around my higher address line issues. having nonfunctional addresslines results in certain parts (size depending on which line failed) of the flash occuring twice in the memory window. Consider the highest line of a 4MB chip being stuck on "L" then a write to 0x000100 will be ok and go to the lowest part of the flash, but you won't do this because your bootloader is located there. 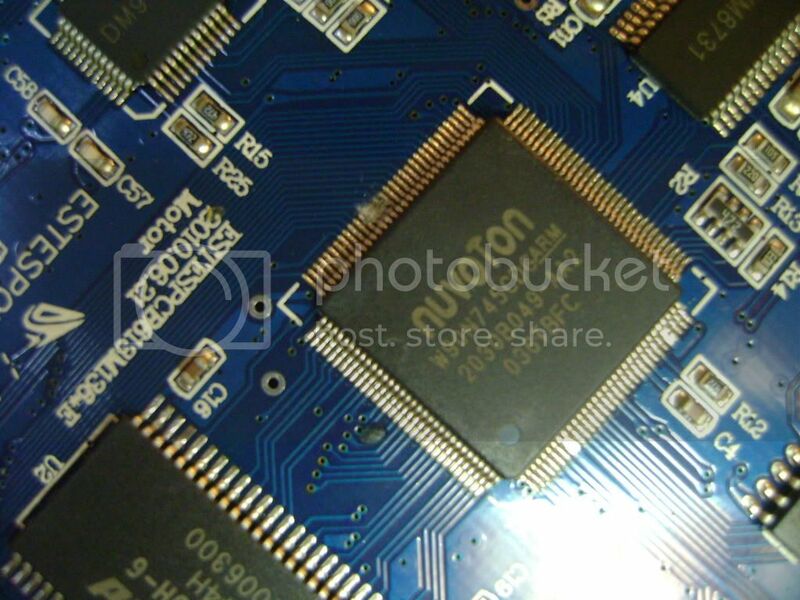 schufti, is there any way of verifying the flash chip then - so reading parts of the flash chip and checking against what should be known values. I have also tried loading the homebrew firmware directly into RAM, and that seems to be working fine - so I am fairly confident the issue is taking stuff from the Flash and not loading stuff onto the RAM.